Need some help with Apokalyx? Check out these cheats, hints, tips and walkthroughs. New info is added regularly. 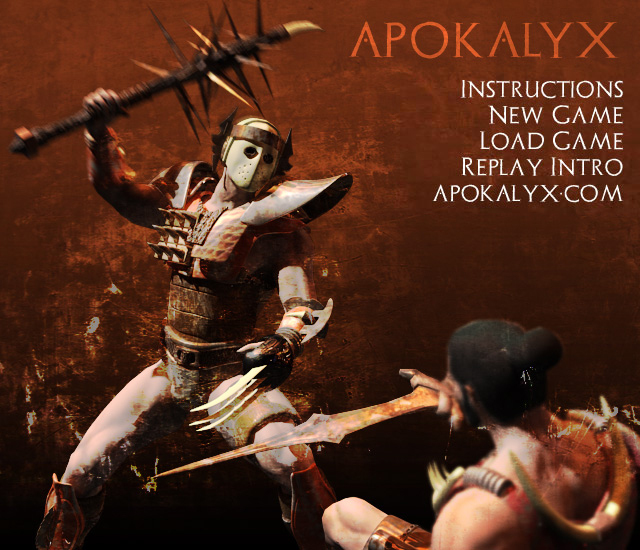 Play Apokalyx now! Find more Crazy Monkey Game Hints and Tips. The world as we know it ended 600 years ago by an unknown cataclysm called the Apokalyx. The lucky ones survived in deep underground shelters, believing that humanity's lack of faith and morals brought down divine retribution. Others fled into areas left untouched by the cataclysm, and re-learned how to live in the wild, thinking that the cataclysm was Nature's rebellion. Not all the people that were caught in the cataclysm perished: the strongest survived, mutated in body and mind, with the convinction that it was a necessary step for mankind's evolution. How Does The Chance To Hit Works? 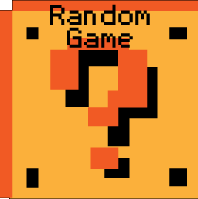 NEW GAME: Click here to start playing. LOAD GAME: If you already have a game saved, click here to restore your game. After every fight, the game automatically saves your game. REPLAY INTRO: Replay the introduction video. When you start a new game the first thing you have to do is to create your gladiator. 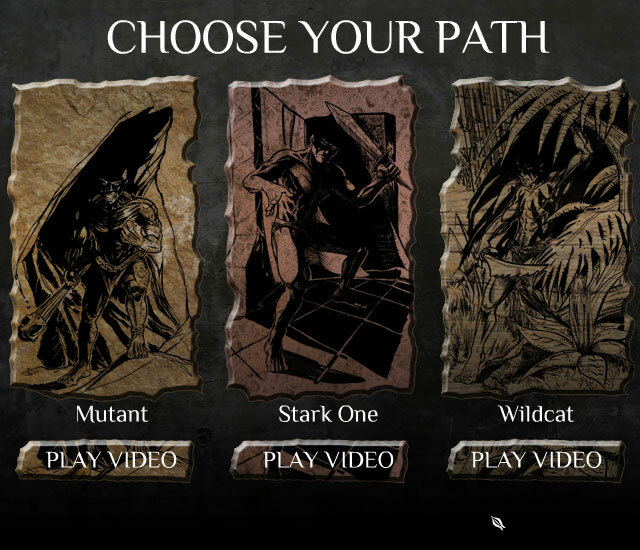 There are 3 gladiator races, each one following its own Path of enlightment: Mutants, Stark Ones and Wildcats. Hover the mouse over an image to read the description of a race, and click PLAY VIDEO to preview that race's introductory video. Click on the image to choose. Light warrior, focuses on speed and dexterity. Good at dodging blows, but fragile. Uses brawl or slashing weapons. Brutal warrior, focuses on offensive potential. Good at inflicting damage, but not very agile and medium stamina. Uses blunt or pole weapons. Defensive warrior, focuses on defense and endurance. Good armor and shield skills, but medium offensive ability. Uses blunt or slashing weapons. Balanced warrior, focuses on precision in attack and defense. Good at hitting and parrying, but medium strength and stamina. Uses pole or slashing weapons. Depending on what you choose, the game will allocate you attribute and ability points. As an alternative, you can choose CUSTOM to spend your points manually (this option isn't recommended for first time players). (2) You can change your gladiator's appearance by clicking on the blue arrows. This change has no effect on the game and is only cosmetic. (3) If you chose custom, you can click on the red minus buttons to remove points, and on the green plus button to add them. In (4) is shown how many points you have left to spend for attributes, and in (5) how many for abilities. If you chose a type of gladiator (e.g. Agile), all your points are already spent. You have to spend all your points to proceed. - Improving an attribute by 1 costs 1 attribute point. - The difference between attributes of the same group (eg. Vigor, Agility and Mind) can't be greater than 5. - Abilities can't be higher than intelligence. - Improving an ability by 1 costs 1 point through 5 points, 2 points from 6 to 10 and 3 points over 11. You will then be given the option to play the tutorial. It teaches you the basic concepts of the game, and is the prologue to your gladiator's story. Click CONFIRM to play the tutorial or CANCEL to skip it. 1) The purple door leads to the merchant, where you can buy sell and repair equipment. 2) The green door leads to the arena. Click here when you have finished your preparations and you are ready for the next battle. 3) The blue door leads to the barracks, where you can improve and equip your gladiator. 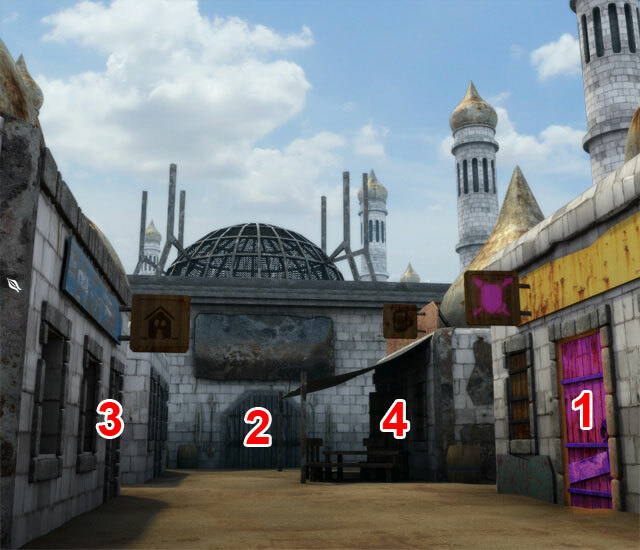 4) The orange door leads to the tavern, where you can hire allied gladiators and buy information on your enemies. At the merchant's shop you can buy, sell and repair your items. You can check out the stats of an item by placing the mouse pointer over it. This shows you how much the item is worth and what the price is (your intelligence stat will modify your prices: higher intelligence means better deals!). - Items that you can't afford are darkened. 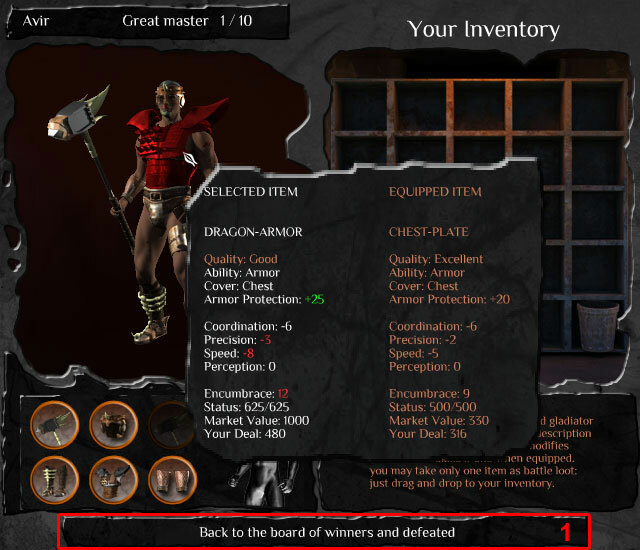 - You can afford items highlighted in red, but you are not strong enough to equip them. INSTRUCTIONS: opens this help guide. TRADER: shows the merchant's inventory, where you can buy sell and repair items. EXIT: exit the barracks and go back to the city screen. To buy an item, drag it from the merchant's inventory to yours. You can also drag it to one of the slots in the lower right box to buy and equip it. To sell an item, drag it from your inventory to the merchant's. Armor gets damaged with every hit you receive, and will get destroyed after enough hits. Your armor condition is represented by the "status" value in the pop up. To keep your armor in shape you can ask the merchant to repair it (for a price, of course!). To repair an item, drag it from your inventory to the repair button in the merchant's window. You can repair all your items at once by clicking the Repair all button. Clicking the green door will show you the number of opponents for the fight: click cancel to go back to the city or confirm to enter the arena and start the fight. In the barracks you will be able to check your stats, improve your gladiator, and equip weapons and armors. To learn more about a stat, a power or a piece of equipment, place the mouse pointer over it. A pop up will appear containing additional information. INVENTORY: opens the inventory page of your gladiator, where you can equip armors weapons and potions. After every battle you receive experience points (XPs for short) to improve your gladiator. You have 3 separate pools of experience points: attributes, abilities and powers. Attributes and abilities work in the same way: each point costs a number of experience points equal to the actual value of the attribute or ability. For example, raising the blunt skill from 7 to 8 costs 7 experience points. The first increase from 0 to 1 costs one XP. To raise an attribute or an ability, click on the green plus icon. Powers cost a number of XPs equal to their rank. At the start of the game your path level is 1 (Novice), meaning that you can only learn first rank powers. When you reach level 2 (Adept), you'll be able to learn rank 2 (Adept) powers, and so on up to level 5 (Grand Master). To learn a power you also need to know all lower rank powers of the same sphere. For example, to learn a rank 3 (Expert) power you need to be at least at path level 3 (expert), know powers of rank 1 (Novice) and 2 (Adept) of the same sphere, and spend 3 XPs. To learn a power click on its icon, and then click "confirm" on the pop up. Path level increases automatically after you have received enough experience. In X is shown how close you are to leveling up: when the number reaches 10/10, your level will increase. When your level increases you will be notified with a pop up. If you have enough XPs to buy a power or improve an attribute or ability, a blue plus icon will appear in the city above the barracks sign. 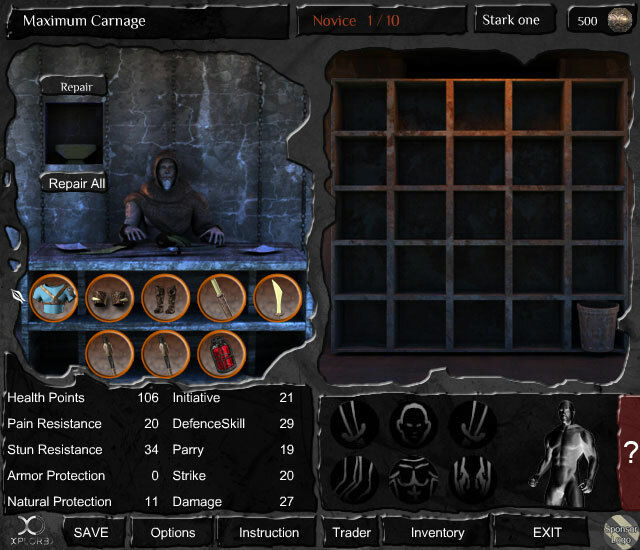 In the INVENTORY screen you can check your inventory and equip weapons, armors and potions for the next battle. If you place the mouse pointer over an item, a popup will appear containing its numerical stats. If you have another item equipped of the same type, the pop up will also contain the stats of the equipped item on the right side, and the comparison between the two items will highlight in green a better stat or in red a worse one. To equip an item, drag it from the inventory to the highlighted area on your gladiator. Alternatively, you can drag the item on the highlighed slot in the lower part of the screen. To equip a potion, drag it from the inventory to one of the two square slots next to your gladiator. To remove an item, drag it from your character or from the slot to your inventory on the right. At the tavern you can hire gladiators to fight by your side in the next battle and pay to receive information about your next opponent(s). 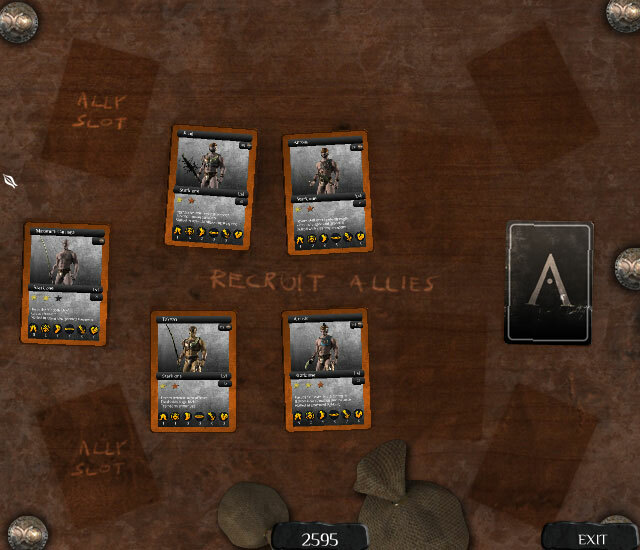 Gladiators are represented by cards. The one on the left is your card. The covered ones on the right are your opponents. Click on a card to have a closer look. To spy on your opponents, click on their card and click confirm. You will pay the required money and their card will be revealed. (3) Gladiator's picture, you can also see what the gladiator is equipped with. (6) Info about the gladiator's style and stats. (7) Powers known for each sphere. (8) The border of the card represents the gladiator's race: green for Wildcats, Orange for Stark ones and Purple for mutants. 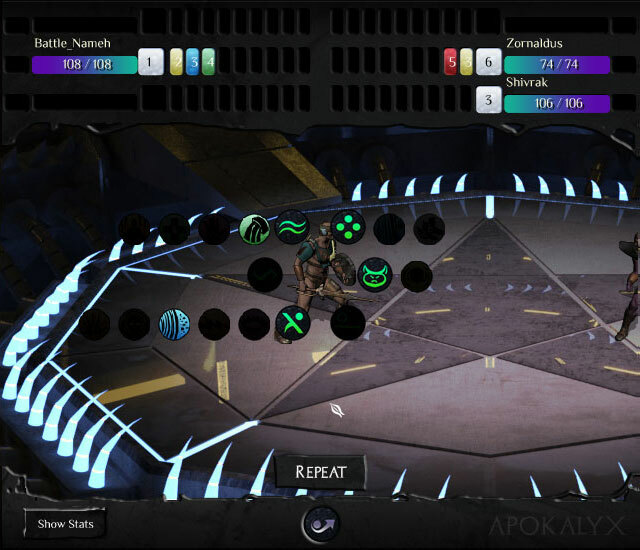 The central part of the table is used to hire allies. You can click up to three times here, every click adds a set amount of coins. After confirming you will receive from 4 to 6 cards (depending on how much you paid). These are the gladiators available for hiring. Click on a card to zoom in, and click on "hire" to recruit the gladiator for one battle. You can hire up to 2 allies each battle. During the last battle of each city, the tavern is closed and cannot be used. You can access the options screen from the merchant or the barracks. 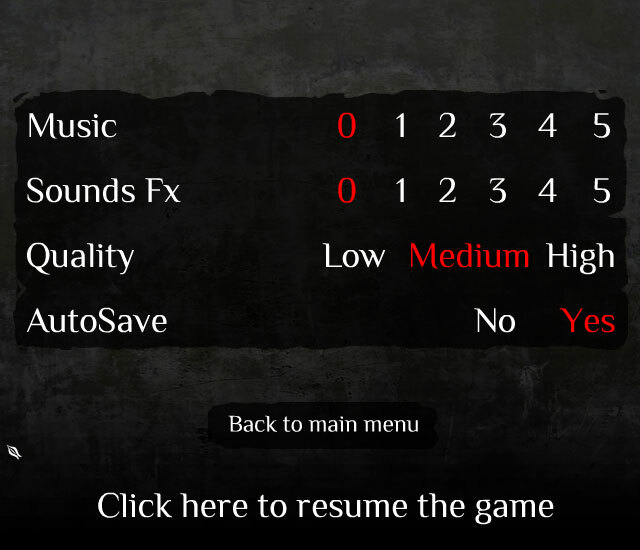 Here you can adjust the music or sound volume, change the graphical quality and enable or disable the autosave. (3) Each bar represents a gladiator health. When it reaches zero the gladiator dies. (4) Pain penalty. This penalty is applied to the die roll in this turn. Increases as health lowers. After receiving a heavy hit the penalty increases a lot for one turn. 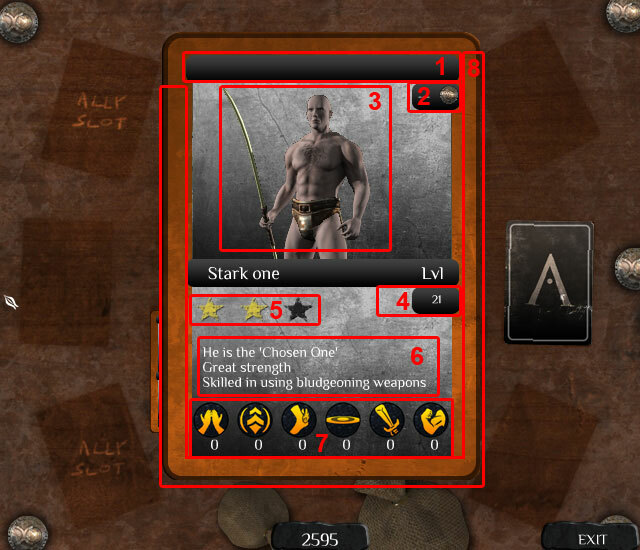 (5) The white box shows the number of passive powers known by the gladiator. Hover the mouse on the number to see the list of powers. Battles are subdivided in rounds. 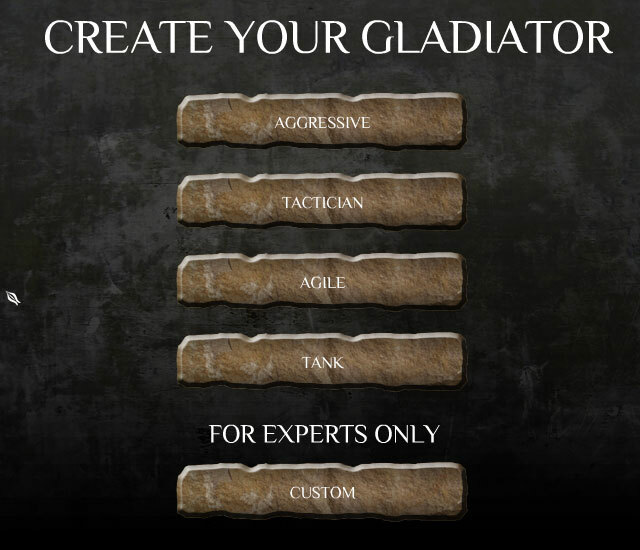 Every round you choose what action you want to take (and the computer chooses for allies and enemies), then every gladiator performs his action and the next round starts. The order in which actions are performed is based on initiative: every gladiator rolls a d20 die and adds his Initiative: the higher value goes first, then the second one, and so on to the lower value. You can click on the enemy to perform an offensive action, or click on yourself to perform a defensive action. After selecting your action, click on the round button (7) to confirm. You can repeat last round's action by pressing REPEAT. You can see your numerical stats by clicking on SHOW STATS (8). The first row (TEMPORARY BONUS) is the current bonus or malus affecting your dice rolls due to current effects on your gladiator. To win the fight you have to defeat all your opponents. (1)Click the icon to attack the enemy. A red claw appears next to him, with the chance to hit. Fast weapons can attack more then once: to make more than one attack click again on the enemy, and select the fist icon again. Another claw appears, and you can see the probability of hitting of each attack. You can assign attacks on different enemies. Note that each additional attack and each change of target cause a penalty to all your attacks. If your chance to hit si very high (higher than 95%), the probability will be capped at 95%, and for every additional 5% you will inflict an additional point of damage. The number in the star is bonus damage on that attack. If you have one weapon equipped in each hand, the right fist icon is your right hand weapon, and the left fist icon is the left hand weapon. (2) Click the blue icon to select an offensive power to use. Click on the icon of the power you want to use. Darkened powers can't be selected (they are passive or defensive powers). 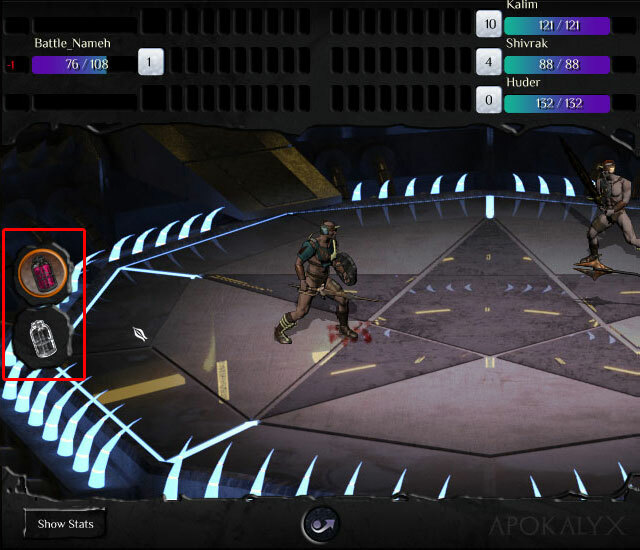 (3) There is an autoparry icon for each enemy: clicking on the autoparry icon of one enemy means that if that enemy attacks you before you act, you cancel your action and try to parry his first attack. (1) Click on the shield icon to parry. In this round you will not attack, but you will try to parry the first attack you receive. If you parry an enemy attack the enemy will be unbalanced, and you will receive a bonus to your attack in the next round. (2) Click the blue icon to select a defensive power to use. Click on the icon of the power you want to use. Darkened powers can't be selected (they are passive or offensive powers). (3) Click the potion icon to drink a potion. Click on the potion you want to drink. If you click on an enemy or yourself, and then change your mind, you can click outside the menu icons to close the menu. This screen shows a summary of the battle. You can see how many XPs and how much money you and your allies received. Also, you will be notified if you get closer to upgrading your level. Winning gives you the right to loot one piece of equipment from an enemy. Click on an enemy's picture to open his inventory. Hover the mouse pointer over his equipment to examine it. To loot an item, drag it from the enemy to your inventory on the right. Note that you can loot only one item total, NOT one for each defeated enemy! Improving an attribute that is already high costs a lot of XPs, so it's more convenient to start the game with a few high stats and the other low than having all stats at the same level. For the same reason, it's better choose a type of weapon and focus your ability points in the relevant skill. Remember that all pole weapons are two handed, so if you want to use pole weapons you won't be able to use shields. Intelligence affects your starting ability points, and gives you better prices at the store. Starting with a good intelligence will make you save a lot of money in the long run, and will allow you to start with an higher weapon ability score. Fortitude is used often when calculating the chance of being affected by enemy powers, so it's useful to have a decent score even if you don't plan to use defensive powers. The pain penalty lasts only one turn, so it's better to perform an action that doesn't require a d20 roll like using a potion or activating a defensive power after you receive a heavy strike. For the same reason, after you damage heavily an enemy attack him again the next turn to exploit his penalty. Sometimes, one attack is better than two even at 95% chance to hit. Look at the bonus damage. If you are having problems hitting or damaging your enemy, remember to PARRY! The counter attack bonus will help you damage an heavily armored enemy or hit an agile enemy. Remember that initiative when using powers is calculated with the FOCUS ability and not the WEAPON ability. It also ignores the weapon penalty, so you can use an heavy weapon and still be very fast when using powers. Remember to repair your armor! You don't want it to break it during a fight when you need it most. Potions are in limited supply at the merchant's. If there is a powerful one it may be useful to buy it, even if you don't need it right now. You never know when it's going to be useful. At the start of the game the merchant has a limited selection of items. As you proceed, he will stock better and better items. If you are undecided on what piece of armor to use, keep in mind that armor penalty is reduced by skill. So if you are skilled enough it is better to equip a more protective armor than one with lower penalties. Two handed weapons add an extra bonus damage equal to half your strength, so use a two handed weapon if you are very strong. Using a shield is not useful if your SHIELD ability is much lower than the WEAPON ability. If you are undecided on what to equip, remember that you can go to the tavern to buy info on your enemies. When looting first look if there is an item that you can use. If nothing is good for you, then loot the most expensive one to sell it to the merchant. You do not have to spend your XPs right away. Often it's better to keep them to buy something more expensive. This is especially true for powers. The armor skill is used to reduce the armor penalty, so when you are suffering armor penalties you should improve it. Look in the stats screen at the barracks to see if there are stats written in red. Look at what stats are used for your powers, so you know what to improve to increase the strenght of your favorite powers. 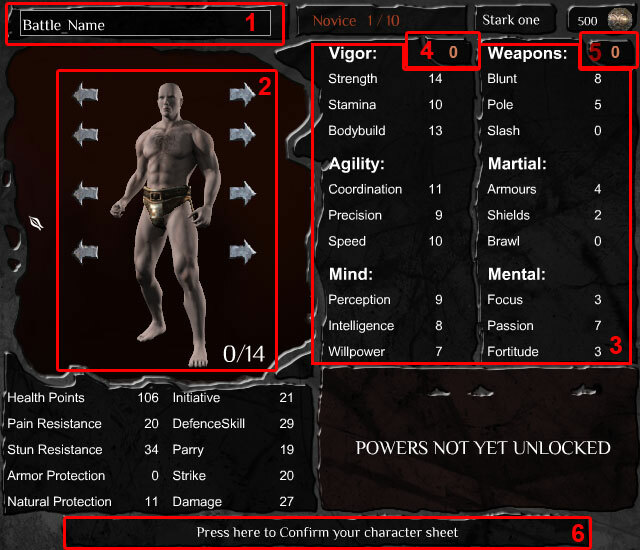 Mutants's vigor stats values can differ by more than 5 points. Mutants have a lower limit for abilites (maxed at 16) but a higher limit for attributes (maxed at 24). With powers that multiply attributes this can make them incredibly strong. Mutants power focus on debilitating the opponent or improving the mutant's stats. If they raise their vigor stats very high and on top of that they also use strength enhancing powers they can be the heaviest hitters in the game. For this reasons, Mutants make excellent brutal fighters. The Sphere of cellular alteration and control of enemies' nervous system. Strikes with penalty -10. Attack does not Damage the target but liquefies one piece of his armor that takes Strength+Wrath Damage multiplied by Mutation. *If you are having problems with enemy armor, this can remove the problem. Note that you can't loot an armor that is destroyed! Strikes with penalty -10. Attack Damage is limited to minimal weapon damage but for Mutation rounds the 3 Vigor stats of the target are reduced by Wrath+Mutation minus target's Stamina. The target dies if any Vigor stat goes under zero. *If you hit with this power and the enemy isn't affected it means that his stamina is too high, so do not use this power on him. Also, if your wrath is high enough you can kill your enemy with this power only even if you don't bring his health to zero! *This can be useful to even the odds if you are outnumbered. Strikes without penalty. Does not Damage but next round the target suffers Damage multiplied by Mutation. The Sphere of powers able to enhance your body as the perfect combat machine. Adds Mutation to all 3 Agility Talents for Mutation rounds. *use this with FORCE to offset the penalty. 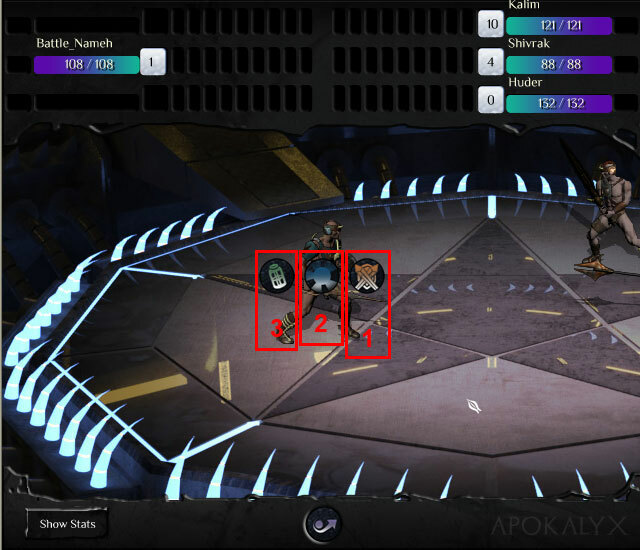 For Mutation rounds Strength is multiplied by Mutation while all 3 Agility Talents are decreased by Mutation. The gladiator suffers no penalty from wounds but can still be stunned. Permanently adds Mutation to Initiative, Strike, Defense and Parry. Each time Damage is received from an attack, the power causes a free counterattack against the attacker using Wrath instead of your Bobybuild to calculate the Damage. The Sphere of body shape control, able to transform you in a terrific killing beast. Attacks with an inhumanly ranged acid spit (using Wrath instead of WeaponSkill to hit) causing Wrath*Mutation Damage. The target armor is always damaged even if the target himself is unhurt. For Mutation rounds each enemy's attack automatically misses if the enemy's Perception+Intelligence+Focus+1d20 is lower than the gladiator's Coordination+Perception+Fortitude*Mutation. Attacking or using a Power interrupt the effect. For Mutation rounds Vigour and Agility stats are increased by Mutation. For Mutation rounds Vigor stats are multiplied by 2 and Agility stats are increased by Mutation. The Sphere of healing and defensive powers, up to immortality. Automatically heals Mutation Health Points each round. 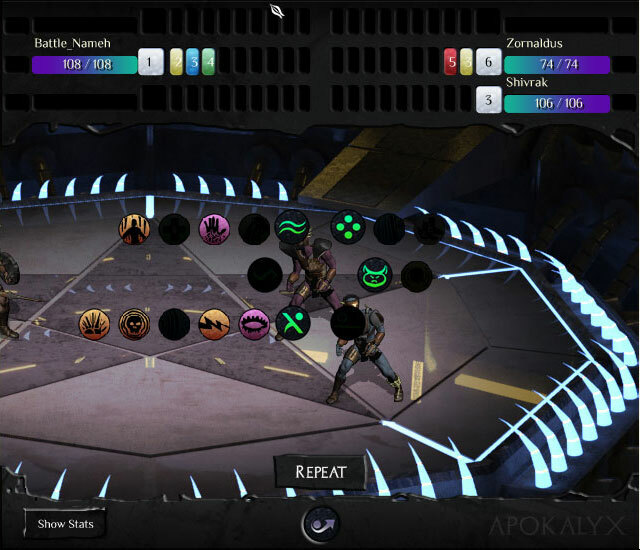 All Damage received by Discipline or Elemental direct attack powers is reduced by Fortitude for Mutation rounds. Damage received is always automatically decreased by Fortitude. The Sphere of Vigor improvement and physical protection. Adds Mutation to all 3 Vigor Talents for Mutation rounds. For Mutation rounds Natural Protection is increased by Fortitude. While stunned, the Natural Protection increases multiplying by Mutation. Creates a sort of natural shield over the skin that protects from (Stamina+ Fortitude)*Mutation Damage and then vanishes. While active Speed is decreased by Mutation. Gives immunity to all Damage for Mutation rounds. In this status the gladiator cannot attack or parry but only use Potions and Focus powers. Creates a radioactive field weakening all opponents. Next round all enemies' actions have a penalty equal to Wrath. Attacks the enemy with a ranged radioactive beam (using Wrath instead of WeaponSkill to hit) causing 2d10*Mutation Damage, decreased by target's Stamina only. Attacks the enemy with a ranged radioactive beam (using Wrath instead of WeaponSkill to hit) reducing target's Stamina by Mutation. The target dies if Stamina goes under zero. The gladiator sacrifices an amount of Health Points equal to Wrath value. All enemies take Wrath*Mutation Damage, decreased by their Stamina stat only. *This is particularly useful if you have RESTORE to regain health without using a turn. Attacks the enemy with a ranged radioactive disintegrator beam (using Wrath instead of WeaponSkill to hit). If Strength+Willpower+Wrath+1d20 is higher than target's Stamina+Willpower+Fortitude+1d20 ..the target enemy dies! *Stark ones make great tactical fighters. Most of their powers are passive, so they can focus their points in fighting skills and still receive great benefits from powers. Adds Focus to next round action. Permanently adds Discipline to Initiative. Heals Fortitude*Discipline Health Points for Discipline rounds. Health Points permanently increase by Fortitude. No penalties from wounds are suffered. Permanently adds Focus to ALL actions. Permanently adds Discipline to Strike. Permanently adds Discipline to Defense and Parry. Initiative with penalty -20 (reduced by Passion). Strike automatically hits the target who may Parry only by rolling 20 on 20dice. Each successful Parry always grants a free immediate counterattack against the attacker. Drinking a potion doesn't use the full round. A new action can be done with -15 penalty to Initiative. Permanently adds Discipline to Speed. The penalty for multiple strikes becomes -3 instead of -5. Furthermore eliminates the -5 penalty to attack different enemies in the same round. Gladiator parries up to Discipline times per round, with a -1 penalty on each subsequent Parry. Multiple Parry actions negate the bonus to counter attack. Team-mates have a bonus to Strike equal to gladiator's Discipline. Add Passion to attack Damage for Discipline rounds. Next round Passion is added to all actions and deducted to all enemies' actions. The more wounds are suffered the more dangerous this power is. Adds to Strike a bonus of 1/3 of lost Health Points! Permanently adds Discipline to attack Damage. Initiative and Strike penalized by -Discipline. Uses Passion*Discipline instead of Bodybuild to calculate the Damage. Strikes with penalty -10. Attack does not Damage the target enemy but smashes one piece of his armor that takes the Strike Damage multiplied by Discipline. Initiative and Strike penalized by -10. The Damage of the attack cannot be reduced by enemy's Armor or Natural Protection. Next round Initiative and Strike are penalized by -Discipline but Damage is multiplied by Discipline! Permanently adds Discipline to Pain Resistance and Stun Resistance. And the penalty suffered from wounds is permanently reduced by Discipline. Focus multiplied by Discipline is added to Natural Protection Only Potions and Focus powers can be used while in this special status. Strike or Power actions interrupt the status. Permanently adds Discipline to Natural Protection. Furthermore automatically heals Discipline Health Points each round. Reduces by Fortitude all Damage received from Mutation or Elemental direct attack powers. Adds Willpower to Natural Protection. Furthermore the first time each combat that Health Points go under zero, the gladiator survives with 1 Health Point! *Be sure to have a way to heal, otherwise surviving with 1 health point means that you will die a round later! *Armor and shield cost double points at the start of the game. It's better to leave them at zero and increase other abilities, and raise them later after the first battles. *Wild ats have very versatile powers, and most of them are active. So wildcats character should keep their FOCUS, INSTINCT and FORTIDUTE abilities very high, because they will spend many of their turns activating powers. All attacks against the gladiator have a penalty equal to Fortitude for Elemental rounds. Permanently adds Elemental to Speed. Attacks the enemy with a ranged sound attack (using Instinct instead of WeaponSkill to hit) that Stun for Elemental rounds if Perception+Coordination+Instinct+1d20 is higher than target's Stamina+Perception+Fortitude+1d20. Summons for Elemental rounds an air vortex that attacks ALL enemies (using Instinct instead of WeaponSkill to hit) causing them 2d4*Elemental Damage, decreased by enemy's Natural Protection only. For Elemental rounds duplicates attack actions. 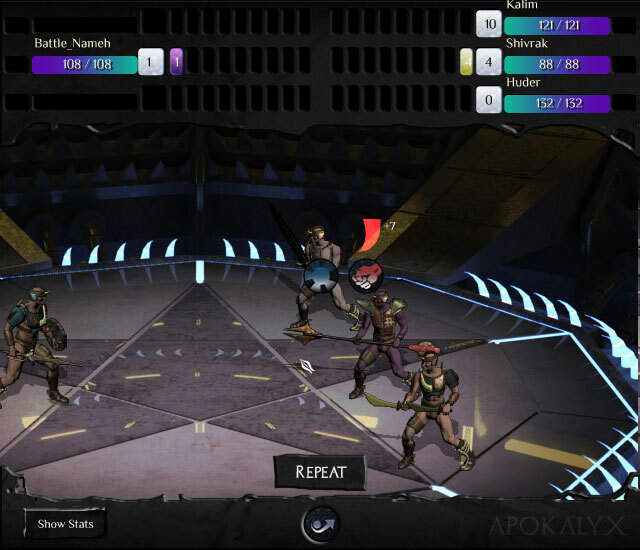 Furthermore gives one free auto-parry action against the first attack of each one of the opponents. Add Focus to Initiative for Elemental rounds. For Elemental rounds each enemy's attack automatically misses if the enemy Perception+Intelligence+Focus+1d20 is lower than the gladiator's Coordination+Perception+Fortitude* Elemental. Attacking or using a Power interrupt the effect. For Elemental rounds Strength is multiplied by Elemental. For Elemental rounds Agility stats are multiplied by 2 and Vigor stats are increased by Elemental. Strike with penalty -10. The attack does not Damage the target but softens one piece of his armor that takes Perception+Instinct Damage multiplied by Elemental. For Elemental rounds Natural Protection is increased by Fortitude. For Elemental rounds the enemy cannot Strike and has a penalty -10 to Defense and Parry. The enemy gets rid of the mud prison if his Strength+Coordination+Focus+1d20 is higher than gladiator's Perception+Coordination+Focus*Elemental. Creates a sort of natural hide over the skin that protects from (Coordination+ Fortitude)*Elemental Damage and then vanishes. While active, Speed is decreased by Elemental. Gives immunity to all Damage for Elemental rounds. 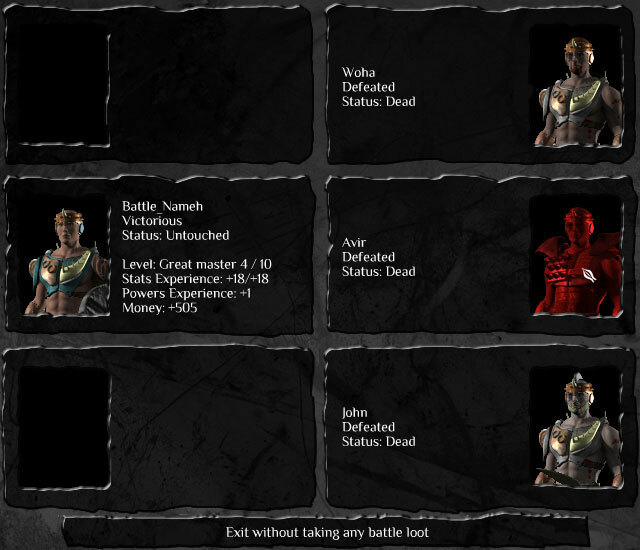 In this status the gladiator cannot attack or parry but only use Potions and Focus powers. Attacks the enemy with ranged light attack (using Instinct instead of WeaponSkill to hit) causing the enemy to suffer a -5 penalty to attack and a -10 penalty to defend for Elemental rounds. *Use this if you have difficulty hitting your enemy. Also, it can be useful to use this before trying to parry. Attacks the enemy with a ranged energetic attack (using Instinct instead of WeaponSkill to hit) causing 2d6*Elemental Damage, that cannot be protected or decreased. Creates a magnetic barrier around gladiator's body for Elemental rounds. 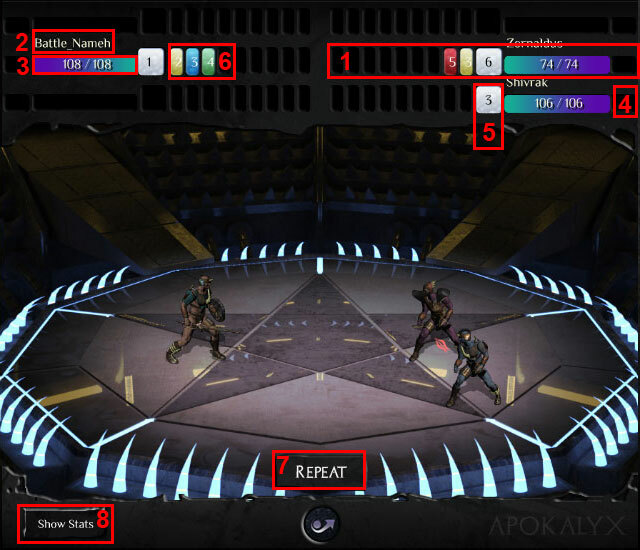 Enemies' Strike and Damage are penalized by Fortitude. The gladiator sacrifices Elemental Health Points. All enemies take Damage for 1d6*Elemental, that cannot be protected or decreased. Attacks the enemy with a ranged energetic beam (using Instinct instead of WeaponSkill to hit). If Perception+Coordination+Instinct+1d20 is higher than enemy's Stamina+Willpower+Fortitude+1d20 ..the target enemy dies! *With high PERCEPTION COORDINATION and INSTINCT this power can be a real killer! For Elemental rounds each attacking enemy takes 2d6*Elemental Damage, decreased by Natural Protection only. *If you can't parry enemy attacks, at least make them pay for them! Attacks the enemy with a ranged fire attack (using Instinct instead of WeaponSkill to hit) causing 2d6*Elemental Damage, decreased by Natural Protection only (causing at least Elemental Damage). Furthermore the target enemy continues to burn for the following Elemental rounds, receiving Damage calculated by decreasing Elemental multiplier by 1 each round. Attacks the enemy with a ranged fire attack (using Instinct instead of WeaponSkill to hit) causing 3d10*Elemental Damage, decreased by Natural Protection only (causing at least Elemental Damage). Special ranged fire attack that burns ALL enemies (using Instinct instead of WeaponSkill to hit) causing 3d10*Elemental Damage, decreased by Natural Protection only (causing anyway at least Elemental Damage). *This is especially useful against 3 enemies. *Remember that you can use this while REBIRTH is active to heal even more! Attacks the enemy with a ranged water attack (using Instinct instead of WeaponSkill to hit) that reduces for Elemental rounds the target's Vigor stats by Perception+Elemental points decreased by target's Stamina only. The target dies if any Vigor stat goes under zero. *If you hit with this power and the enemy isn't affected it means that his stamina is too high, so do not use this power on him. Also, if your INSTINCT is high enough you can kill your enemy with this power only even if you don't bring his health to zero! Heals Fortitude*Elemental Health Points for Elemental rounds. *Remember that you can use REHYDRATATION while this is active to heal even more! Attacks the target with a ranged water attack (using Instinct instead of WeaponSkill to hit) that causes, for 2 rounds, 1d10*Elemental Damage, decreased by enemy Stamina only. Enemy is also stunned if your Instinct is higher than his Fortitude. *This is good to bypass enemy armor. Also, stunning an enemy can help you even the odds if you are outnumbered. Heals the gladiator and ALL allies Fortitude*Elemental Health Points. ALL enemies suffer 1d6*Elemental Damage, that cannot be protected or decreased. *the more gladiators are in the arena, the better this power is! Also, this is the only power that can heal your allies. How does the chance of Hit work? When a gladiator attacks, the game rolls a d20 die and adds the STRIKE stat. If the total is equal or higher than the target's DEFENSE stat the gladiator hits, otherwise it misses. If the roll is 20, you roll another d20 and add it to the total (and again if you roll another 20, until you roll a different result). If the roll is a 1 you automatically miss. COORDINATION + PRECISION + the weapon skill (e.g. BLUNT ) + the strike bonus of the weapon equipped + miscellaneous modifiers. -If the gladiator strikes an opponent before the opponent has acted in a round, there is an additional +5 bonus. -Bonuses or penalties due to the effect of powers or potions. -Penalties due to wounds and pain. 10 + PERCEPTION + SPEED + weapon skill + the defense bonus of the shield or the equipped weapon. For example, if your STRIKE is 25 and the enemy has DEFENSE 40, you need to roll a 15 or higher to hit. That means that you have a 30% chance to hit. If your total is higher than enemy's DEFENSE stat, the difference (the "margin") is added to your damage roll. Weapon's damage + STRENGTH + BODYBUILD + margin - enemy's DAMAGE PROTECTION. STAMINA + BODYBUILD + armor protection. If a power's damage is reduced only by natural protection it means that armor is ignored. Using 2 weapons gives you a -30 penalty for the right hand and a -35 penalty for the left hand. Both penalties are reduced by COORDINATION and weapon skill. Also, each time you change target there is an additional -5 penalty.